Whether you are a solo artist, a band, a music company or any other show business representative, you won‘t go without launching a music website. Actually, it is no wonder as there are, probably, no users, who don’t look for their favorite songs, music compositions and information about musicians on the web. If you have recently decided to present your talent to the audience and launch a website of your own, then using a website builder will be the simplest and the most reasonable solution. Website builders are easy-to-use and convenient for professionals and non-tech-savvy users. This is exactly what you need to launch a quality musician’s website, if your web design skills are insufficient to utilize more complicated tools. Websites for musicians created with website builders have appealing designs and proper functionality to attract the attention from the very first sight. They contain all the required information about your creativity, make it possible to download favorite songs, albums and videos of users, provide up-to-date information about your events, upcoming concerts and shows. They also grant access to your social network accounts, where users can communicate, share their ideas, emotions and browse their favorite music collections. Websites for musicians differ from the majority of other niche websites due to their special parameters, configurations and must-have elements. They have to provide maximum information about an artist or a band. A website builder chosen for this purpose should be logically-structured to ensure intuitive navigation and simple web design process. This is one of the most vital factors for musicians, who wish to work on website development on their own. Musicians are always too busy and unprepared to study complex web design aspects. When using website builders, musicians get full control over each step of website design process, being able to further make the required changes when needed. The number of website builders you can use to get a project for musicians is not limited to a couple of services. There are all-in-one and specialized solutions you may choose from. Let’s have a look at the most decent options now. 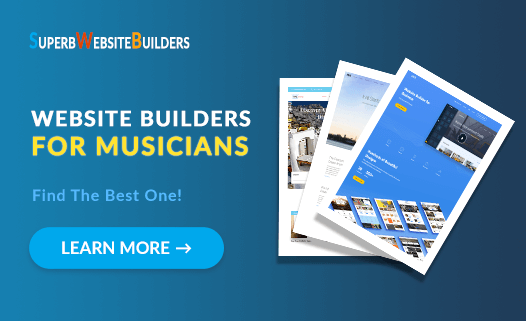 Wix – is the most popular and the most functional website builder for musicians. The system is user-friendly and provides the unsurpassed WYSIWYG website building experience. This is an ideal tool for creative people, who have never built websites before and don’t wish to struggle with complex codes to launch a decent website to meet their needs. Apart from the standard editor, the system offers a one-of-a-kind Wix ADI tool. It lets inexperienced musicians create their websites in no time, handling all the details for them in the automated mode. Wix also allows connecting a forum and a blog to your website, thus keeping users engaged in your website updates and communication with other fans. Wix is known for its eCommerce engine, which lets you create and manage an online store, where you can sell your albums, tracks, accessories, brand items as well as issue discount coupons, certificates and what not. Finally, Wix boasts one of the finest collections of niche templates for music websites you may choose from (Solo Artist, Band, DJ and Music Industry are the major categories here). They are 100% customizable and you can modify them as you need. Cost: The cost of the paid plans ranges from $4.50 and up to $24.50 per month. There is also a free unlimited plan you can use to test the entire feature set of the service. uKit – is a great choice for the creation of websites for musicians or bands. It lets you establish trusted online presence for your brand in around 30 minutes. This is a real found for musicians, who do not wish to bother about web design nuances. uKit is a perfect choice for newbies and here is why. uKit supports drag-and-drop functionality and allows controlling each step of website development. uKit offers a decent eCommerce widget and an opportunity to connect your Ecwid account (if any) to start and manage an online store. You can also connect the SoundCloud widget to let you add and update audio tracks to your music website. Finally, uKit comes with a collection of responsive music templates, among which you can find those applicable to your music website. Cost: The cost of using uKit starts with $4 for the cheapest plan and ends with $12 per month for the most expensive subscription. Bandzoogle – is a specialized musicians’ website builder. Being initially launched by a musician, the system has a motto that sounds like “From Musicians for Musicians” and this is the fact that speaks for itself. With an intuitive and engaging interface, abundance of niche-specific web design tools, extensive customization options and responsive music templates, the system deserves the attention of musicians from all over the world. With Bandzoogle offers extensive blogging and eCommerce options, powerful synchronization tools, social media services. You can stream music directly at the website, sell physical/downloadable albums and brand accessories without any commission fees, send newsletters to your fans to keep them aware of your career news. It is also possible to create an event page here to list the upcoming shows, concerts and presentations and let your fans book and buy tickets for the upcoming occasions in advance. Bandzoogle currently offers over 200 music-focused templates, which are free, responsive and sorted out by industry (rock, folk/country, jazz/blues, singer/songwriter, classical, urban/hip hop, world, EDM/DJ/Producer, business/other, beats etc.). Cost: The cost of using the system starts with $8.29 per month for a Lite Plan and ranges up to $16.95 per month for a Pro Plan. Bookmark – is the AI-powered website builder, which deserves a decent position in the list of the best services for musicians. The system comes with an Artificial Intelligence Design tool, which brings all the web design hassle to the minimum. This is what matters most for musicians, whose web design experience is not sufficient for the development of large-scale websites. Bookmark’s AIDA Assistant can automatically create a musician’s website in a matter of minutes. Just provide these data and the service will generate a decent website filled with your own content. Integrated eCommerce module makes it possible to set up and then effectively manage a web store to sell your products (albums, videos/audios, accessories, items and souvenirs for fans). Cost: Bookmark has a lifetime free package. The cost of paid plans starts with $11.99 per month and reaches $24.99 per month for the most costly subscription. WordPress – is the outstanding Content Management System to create a musicians website. What you should know, though, that it is somewhat more complicated than standard website builders, which is explained by its extensive integration options. Thus, it is desirable that WordPress users should possess web design skills to create functional websites. To get the most out of WordPress functionality, you should go online and look for the best themes for musicians there. Fortunately, the choice is really stunning and it won’t be a problem for you to get the template you really like. As to the integrable plugins for musicians’ websites, the selection is fantastic as well. The must-have plugins for any musicians’ website include Event Organizer, GigPress, MF Gig Calendar, NextGEN image gallery, HTML5 jQuery Audio Player, Spotify Master, SoundCloud Master, Thank Me Later, Comment Redirect, Gravity Forms, Audiotheme, Cue and Foxyshop to mention a few. WordPress is a free system, but to publish and manage a website, you’ll need to pay for hosting and domain name. Cost: The final cost will depend upon the hosting provider you will go for. Plugins and themes may also come at extra cost. Actually, it is even safer to purchase them to prevent the scams, which are frequently associated with free templates and plugins. A website can become an effective must-have tool for any musician, but only if this is a well-designed project with advanced functionality. Let’s face the fact: if you are a musician, the chances that you have a good command of programming basics are quite low. This is where website builders come into play. These systems are simple, convenient and intuitive. That is why, they work great for inexperienced users, helping them design outstanding websites. Wix is the best website builder for musicians, which can boast a rich collection of mobile-ready templates, advanced design customization options and outstanding functionality. uKit is the most affordable small business website builder, which is also a nice choice for the development of musicians’ websites and ensures decent result. 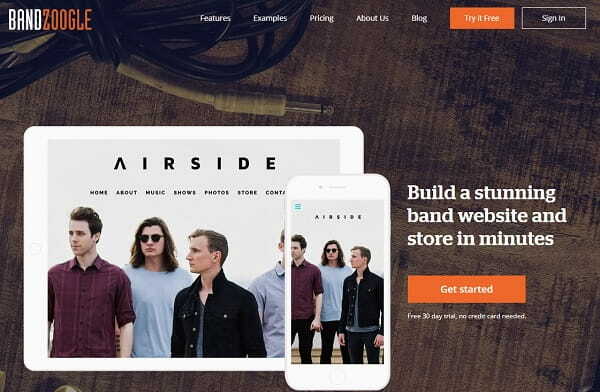 Bandzoogle is a specialized music website builder, the entire feature set of which is centered around the development of websites for musicians. Free trial for 30 days. Bookmark is a cloud website builder, which deserves special attention of musicians due to its Artificial Design Intelligence Assistant and eCommerce functionality (you can sell your songs online). WordPress is a popular CMS, which is free to donload, flexible and powerful enough to let you create decent music websites at reasonable cost. Coding skills are required. The list of website builders to create a website for musicians or bands is quite impressive, but you should be aware of the characteristics, pros and cons of each service to make the best choice. It makes sense to test all of the systems reviewed in the post to decide on the most suitable solution you’ll be eventually satisfied with.